If you work in an office, you already know this: Meetings are the worst. “They can look and feel like a garbage can,” observes Brian Gunia, a professor at Johns Hopkins Carey Business School who studies groups, negotiations and decision-making. Everyone tosses in their opinions and their own agendas, and the words (and, God forbid, the PowerPoints) get all mixed up in a stew that’s not very tasty. Groups of individuals often accomplish less than any one individual could, Gunia points out. And meetings are often dominated by a few loud personalities that drown out any of the disagreement that might make a meeting worthwhile. Gunia suggests encouraging healthy debate and always having an agenda. Some CEOs and managers are waking up to the reality here. Microsoft chief executive Satya Nadella told workers to skip meetings if they don’t truly need to go, Bloomberg recently reported. Unfortunately, not all bosses are so enlightened, and sometimes you can’t wriggle out of an engagement. 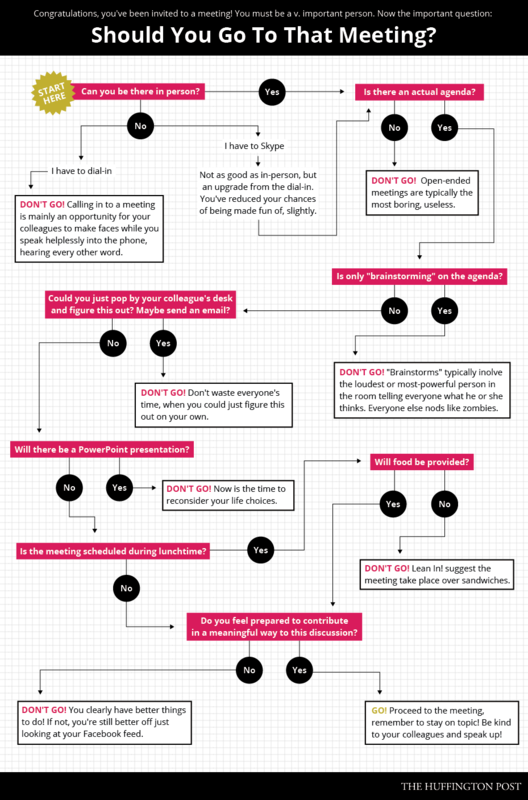 If you’re having trouble deciding whether to attend a meeting, we’ve created this nifty flowchart to help.